20% off A2 Digital Posters! Make sure your Christmas Events are a success, big style! 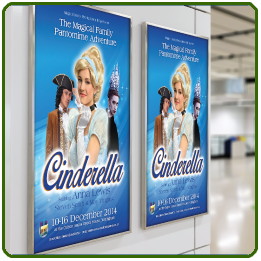 Our huge A2 Digitally Printed Posters are a direct way to get your message out ,and with 20% off during November and December exceptionally cost effective too. Please note: Offer only available on A2, digitally printed posters, on quantities up to 200. Offer runs from the 1st November until to 31st December 2014. Offer not to be used in conjunction with any other offer or promotion. Does not apply on bespoke quotes. 15% off Roped and Eyeletted Outdoor Banners. 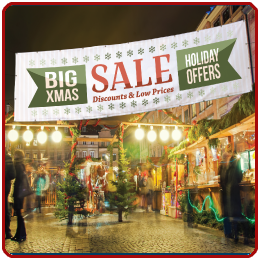 Make a big impact at a small price with our cost effective outdoor Banners, great value to start with, but in November and December simply unbeatable with 15% off. Printed on durable heavy duty vinyl with light fast inks. Please note: Offer runs from the 1st November until to 31st December 2014. Offer not to be used in conjunction with any other offer or promotion. Does not apply on bespoke quotes. New Deal on Business Cards! 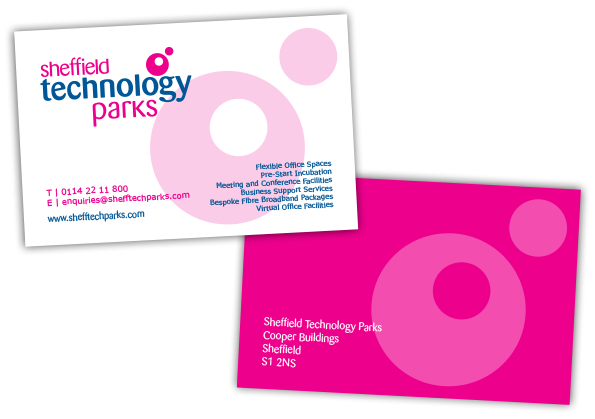 From November the 1st we are launching a great new, permanent deal on Business Cards. 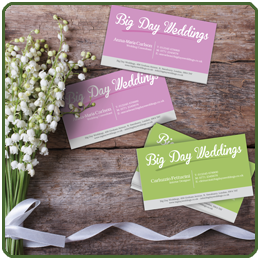 Our great quality cards on 400gm matt stock will be available on a quicker turnaround and at lower prices! A real winning hand! For more information or to place an order call us on 0114 221 0217 or email Sarah at sarah@newstartdesign.co.uk. Our products for Christmas are the most exciting ever, a real cornucopia of traditional and innovative. Get your Christmas orders in early and we will give you a huge, massive and enormous 20% off everything you buy. This year don’t leave everything until the 24th! Order now and save. Please note: Offer applies to products featured in our Christmas Portfolio only. Offer valid from 1st September to 31st October. Offer not to be used in conjunction with any other offer or promotion. For the next two months we are offering an exceptional deal on a selected range of our Books and Booklets. 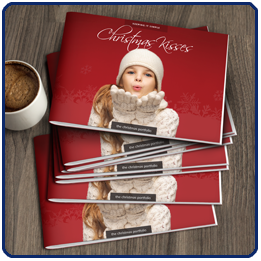 Our offer is on 16 Page, 32 Page and 48 Page Self Cover Portrait or Landscape Litho printed Books and Booklets in any quantity up to 5,000. Such a discount off our already keen prices really makes these most popular sizes unbeatable value. Get them while it lasts! Please note: Discount applies to Litho Printed Books and Booklets only. Page count must be either 16, 32 or 48 including cover to qualify. Offer limited to quantities up to 5,000. 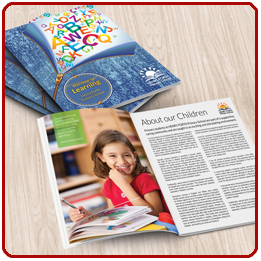 Discount is available on Books and Booklets with the same cover material as the inners (self cover). Discount is not available on special Finishing (Digital Embossing Etc). Offer valid from 1st September to 31st October. Offer not to be used in conjunction with any other offer or promotion. During September and October in particular it pays to be pally! Pair up with a friend or colleague and order your cards at the same time and one of the sets will be free. Our special offer is available on 500 Litho Printed Full Colour Double Sided Matt Laminated both sides Business Cards, and makes them absolute ‘give-aways’. Please note: Discount applies to 500 Litho Printed Full Colour Both Sides, Matt Laminated Both Sides Business Cards on 400gm Matt Art Card. Offer limited to quantities up to 500 only. Discount is not available on cards with special Finishing , Digital Embossing Etc. Offer valid from 1st September to 31st October. Offer not to be used in conjunction with any other offer or promotion. Design of a logo, double sided business card, and poster for YourNorwich. YourNorwich was set up and run by NHS Norwich. 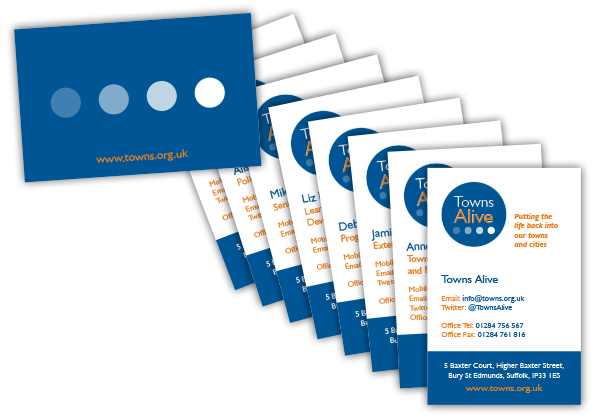 A set of eight 85mm x 55mm business cards for Towns Alive, part of Action for Market Towns. 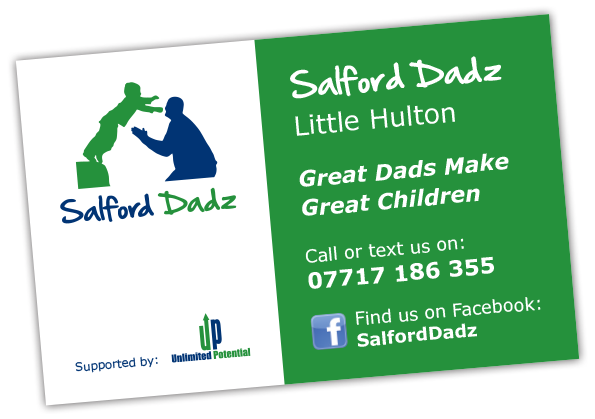 An 85mm x 55mm single sided business card for Salford Dadz community group, organised and supported by Unlimited Potential. 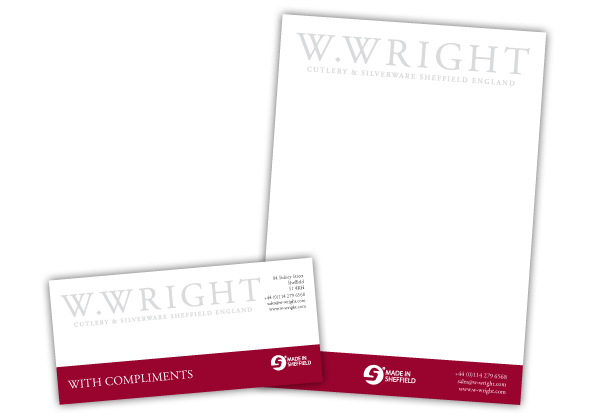 Thicker Letterheads & Compliments Slips! During March and April we are offering you the chance to buy upgraded Letterheads and Compliment Slips at no extra charge. Our standard Letterheads and Compliment Slips are printed on Smooth 100gm Executive paper, but from the 1st of March until the 30th of April you can have 120gm instead at no additional charge. Both our Executive stocks are Laser Guaranteed and print perfectly using Ink Jet too. Thicker letterheads will certainly give your message added gravitas, and with nothing extra to pay the choice is clear! Please note: Offer available on both single and double sided Letterheads and Compliment Slips, on quantities up to 10,000 printed in Full Colour on Executive stock and on any size. Orders must be placed between 1st March 2014 and 30th April 2014. This offer does not apply to Bespoke quotes and cannot be used in conjunction with other offers. We launched our Personalised Wallpaper at the start of the year and it is already proving a real winner. During March and April we are offering you the opportunity to change your decor for less, much less. In fact 50% less!! 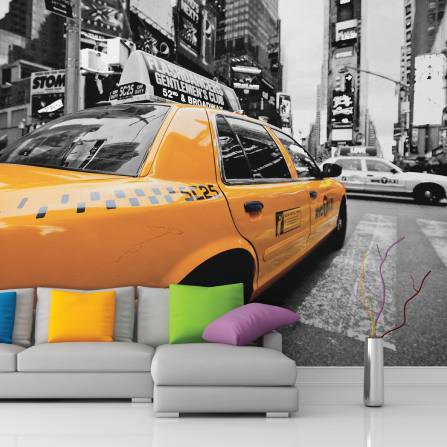 For two months our personalised Wallpaper is Half Price. So you can paper a wall 4m long by 3m high just the way you want to for less! Please note: Maximum area 30 square metres. Orders must be placed between 1st March 2014 and 30th April 2014. This offer does not apply to Bespoke quotes and cannot be used in conjunction with other offers. Printing on one side of your business cards only tells half a story. Just imagine the benefits of being able to put extra details on the reverse, making your card a real selling tool and not just an introduction. Well, during March and April, with our offer you can simply order your card single sided and we will print it double sided for the same price. Please note: Offer applies to Business Cards printed in Full Colour on 400gm Matt Art card and for quantities up to 2,500. Available on any Business Card Size. Orders must be placed between 1st March 2014 and 30th April 2014. This offer does not apply to Bespoke quotes and cannot be used in conjunction with other offers. 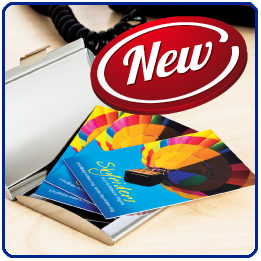 Our recently launched 600 Micron Matt Laminated Both Sides Prestige Business Cards have a luxury feel. They really do hit the mark when it comes to ‘the one chance to make a great first impression’. Even the packaging is designed to set our cards apart. They come packed in Plastic Card Boxes with a Silver Card Holder included. If you would like to get your hands on this premium product at a far from premium price then now is the time.